Bill does a great impersonation of the Prime Minister. He does a brilliant impersonation of Charles. It’s a very serious offence to impersonate a police officer. She’s the woman who impersonates all the celebrities on TV. He was charged with impersonating a police officer. The children start showing off the minute anyone comes into the house. Young musicians will get the chance to show off their musical skills. The trousers were very tight-fitting, showing off her slim figure. She brought her baby pictures so she could show them off. That shirt shows off the color of your eyes. She only bought that sports car to show off and prove she could afford one. He‘s always showing off to his classmates. She likes to wear short skirts to show off her legs. She likes to show off her collection of porcelain cats. That tight dress really shows off her figure. The ballet was choreographed by Ashton. Inflation figures have fluctuated wildly between 0.2 and 25 percent. It was wildly (= very) expensive. I’m not wildly (= very) happy about the idea. The dollar fluctuated wildly against the yen. The figures are wildly inaccurate. Motown is still alive and kicking at an elementary school in Los Angeles – and people can’t get enough. 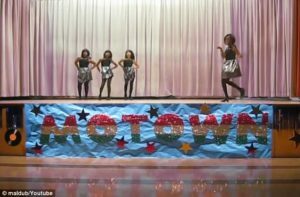 The kids of Baldwin Hills Elementary, have become world famous online sensations with millions of fans thanks to videos of their performances at the school’s annual Motown revue, featuring incredible choreography, costumes and, of course, tons of talent. Every year, the revue features kids of varying ages donning amazing costumes and learning the moves to match some of the Detroit soul label’s biggest stars. 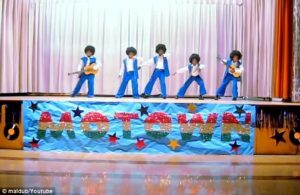 One video taken of the event, featuring a group of boys impersonating the Jackson 5, has been viewed more than 35 million times. He was found alive and well after three days. The idea of marriage is still alive and kicking. 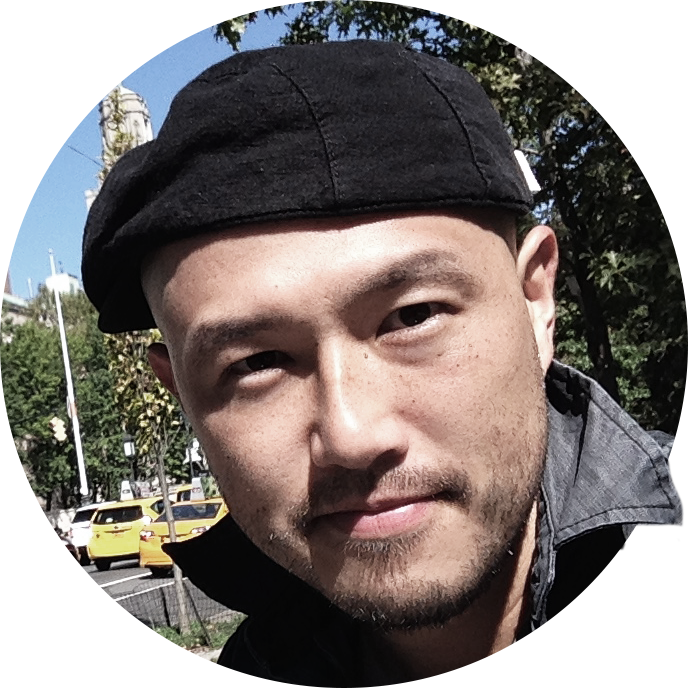 Traditional jazz is still alive and well in Chicago. Fans of horror movies just can’t get enough of this sort of stuff. Salary scales vary between states/from state to state/according to state/with each state. We have tried several different approaches, with varying degrees of success. The value of stocks will vary from month to month. My husband varies the vegetables he plants each year. It would be difficult to match the service this airline gives its customers. Our office failed to match the growth of the rest of the company. Third grade teacher Malinda Williams, the brains behind the idea, was inspired to organize the yearly event by her own background growing up in a home that constantly had Motown songs playing. ‘Once I became an educator, I felt compelled to share what I learned growing up with my students,’ she told the Huffington Post. She added that even back in 1996, when she was first looking for teaching jobs, she was telling schools about wanting to pass on her love of dancing to her students. Soon enough, she was putting her skills and passion behind the elementary’s holiday performances. For one Black History Month, she turned a group of boys into mini Temptations for a performance of My Girl, and it was a huge hit. Sheila is the brains behind our new environmental initiative, so she deserves all the credit. I wonder which of my enemies is the brains behind this latest rumor about me. He felt compelled to report the incident. I feel compelled to write to thank you. The order compelled him to appear as a witness. When you’ve read this message, please pass it on. I’ll pass these clothes on to my nephew when my lads have outgrown them. No one passed the news on to me. Then, in 2013, the school found itself needing to raise money to keep on their music teacher, and Malinda stepped in with a plan for a Motown-themed fundraiser. With its simple messages, clean lyrics and uplifting music, Motown is an excellent choice for bringing people of all ages together – so its no surprise that Malinda’s colleagues were thrilled with the idea. Over seven months, she coached the kids in how to look and act just like artists including Martha Reeves and Smokey Robinson – taking on a role not unlike Maxine Powell, who ran Motown’s famous Charm School. With help from parents and other teachers, Malinda was able to teach the choreography and design costumes to transform the children z 60s and 70s soul stars. I found her wandering the streets in a complete daze. Only highly skilled people were kept on after the merger. For me it was a marvellously uplifting performance. The disaster brought the community together. The event was unique in bringing together politicians, business leaders, and academics. Fate has brought us together. Songs performed by the kids include Dancing in the Street, My Guy, Stop in the Name of Love and the aforementioned I Want You Back, which became a massive viral hit when the video was uploaded online. But not only have they gained legions of fans, the annual event has raised thousands of dollars for arts education. It also caught the attention of celebrities, including Motown founder Berry Gordy, who was so impressed that he invited the kids to perform at a family fundraiser. The group of boys who impersonated New Edition for a performance of If It Isn’t Love were event invited by the manager of the group to perform with them at a concert. The aforementioned was/were seen waiting outside the building. The aforementioned had already been convicted. Here’s a list of the top ten viral videos this week. Within days the film clip went viral. Tim seems like a regular guy. They are mostly raw recruits, not professional soldiers. Even when she first started skating, you could see the determination and the raw talent. Alex was just a raw recruit when he was handed this job. The band has legions of fans. He failed to turn up for the concert, disappointing the legions of fans waiting outside.